Fixing the regulatory regime for outsourcing requires both new modes enforcement and reforms that target corporations’ systematic evasion tactics. At Taylor Farms in Tracy, California, one of the country’s major salad producers, Susie Serna works in quality control, making sure food production standards are upheld. But lately, it’s the quality of the jobs she’s been worried about. In her department, she sees temporary workers constantly milling through, facing safety risks at work and constantly at risk of losing their jobs altogether. The workers at some of the most abusive companies in the country are not actually employees, and their bosses aren’t technically the ones who pay their wages. In the twenty-first-century workplace, the activity formerly known as work is now a tangle of subcontracts, temp jobs, 1099s and freelance gigs, allowing companies to atomize their workers across many firms in a diffuse production chain. At the same time, firms limit their responsibilities to pay fair wages or respect workers’ rights. Many workers, in turn, are multilaterally disempowered—alienated from the worksite’s firm at the top of the chain, detached from the staffing agency in the middle, and unprotected by the government or unions. While contracting makes sense when firms need short-term specialized services, such as catering or web design, in many low-wage industries—and even in the public sector—the outsourcing of a firm’s core job duties has become a strategy to efficiently circumvent labor, environmental and civil rights policies. Thanks to legal loopholes and toothless oversight, NELP argues, outsourcing allows companies like Taylor Farms to “distance themselves from the labor-intensive parts of their businesses” by contracting out jobs that would otherwise be done by real employees. The company can slough off labor costs by contracting with a staffing agency or subcontractor, which in turn chops down pay scales, extends work schedules or downsizes the workforce to maximize profits for both firms. 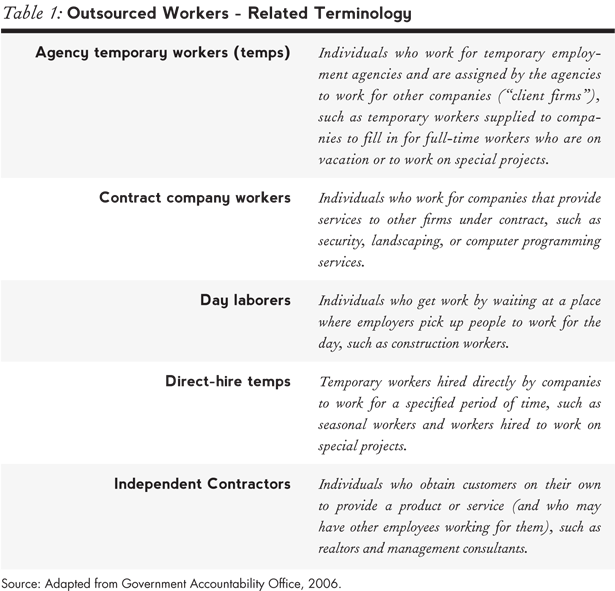 In addition to using“manpower” staffing agencies, companies circumvent labor regulations by hiring so-called “independent contractors”—a frequently misused category that excludes workers from standard labor protections and benefits. In the fast-food industry, a far-flung network of chain outlets under a single brand enables franchisees to saddle workers with harsh working conditions and poverty pay scales while feeding profits to the top of the corporation. On top of low pay, the outright theft of wages has become almost routine in many outsourcing-heavy sectors. 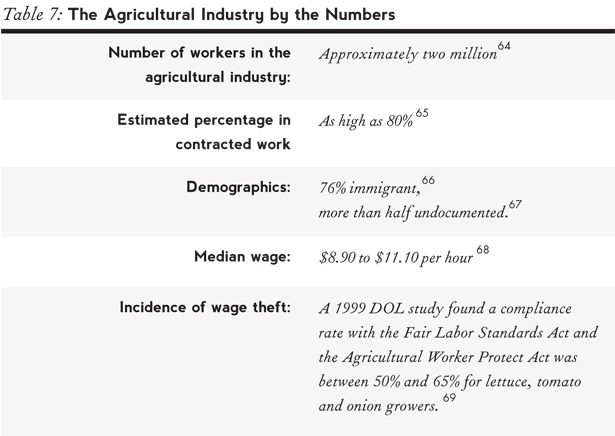 Nearly 90 percent of fast-food workers reported experiencing wage theft in one survey. 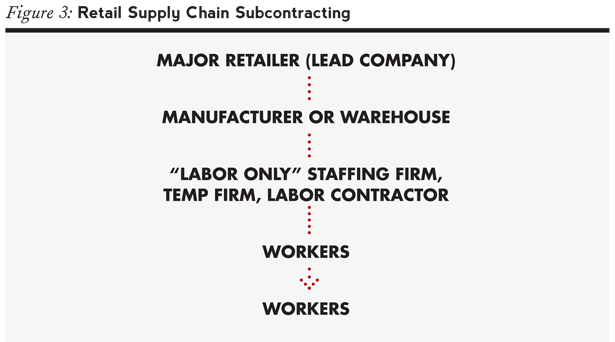 Similar patterns of labor violations are prevalent in home healthcare and warehousing industries, where much of the workforce is supplied through contracting agencies. And while many of these workers, in large part immigrants and people of color, face extraordinarily high injury rates and constant job insecurity, they are often cheated out of workers’ compensation insurance and excluded from their states’ unemployment insurance benefits. At California’s ports—where many labor disputes have erupted in recent months—the industry’s shift to using drivers dubiously labeled “independent contractors,” rather than standard employees, has “correlated with a 30 percent decline in wages between 1980 and 1995,” according to NELP. Today’s “independent” drivers remain impoverished, essentially tethered to the trucking companies, and are often forced to pay for their vehicles. 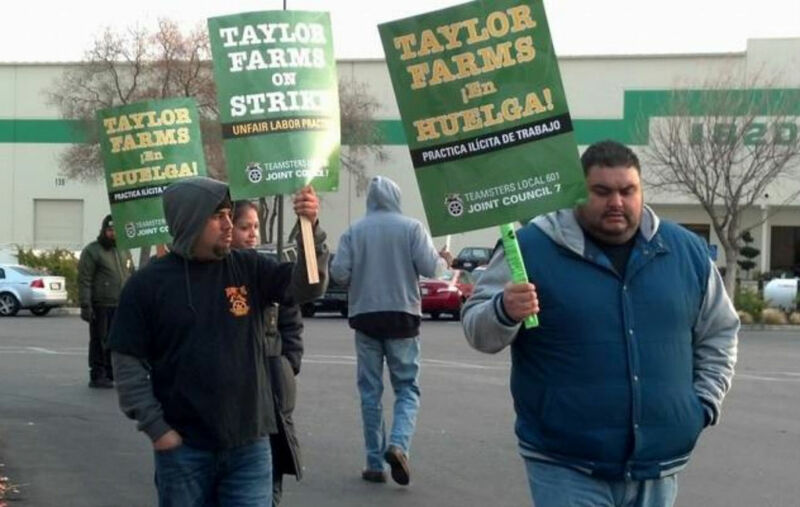 Taylor Farms exemplifies this structural casualization of wage labor. The workers hired through two staffing agencies, SlingShot and Abel Mendoza, create an unregulated pool of labor that erodes working conditions for all, according to labor advocates. Both temp and regular hires have complained about getting cheated out of pay, exposure to hazardous fumes, unsanitary facilities and being forced to work off the clock. On the regulation of outsourcing and contingent labor, other countries are well ahead of the United States. In Brazil, ProPublica reports, temp contracts are limited to three months, and some countries, such as Italy and Japan, ban the use of temps in specific industries or as a method of displacing permanent workers. Some states are now taking legislative action to curb outsourcing abuses. Currently, according to ProPublica, “At least 10 states currently have laws that regulate temp and day labor agencies in some way.” But they largely focus on registering the staffing companies, or curbing unfair costs, such as transportation fees. California may go a step further to directly regulate subcontractors and staffing firms in a pending labor-backed bill, which would force lead companies to take responsibility for labor violations “committed by their own labor suppliers, to workers on their premises.” In other words, it centers liability on the company controlling workplace and working environment, not just the name on the paycheck. Fixing the regulatory regime for outsourcing requires both new modes of enforcement and reforms that target corporations’ systematic evasion tactics. Some workers’ groups in the farm and garment industries have brokered private codes of conduct involving multiple companies along the supply chain. The Fair Food program established by the Coalition of Immokalee Workers, for example, commits grocery and restaurant chains to pay a premium on tomatoes to be passed down to farmworkers’ paychecks. But NELP warns that these private agreements, while theoretically backed by a formal contract, are often difficult to enforce and reliant on corporate voluntarism. NELP recommends “joint liability” regulations to make it easier for workers to take legal action against more than one firm if several companies are responsible for wages and working conditions. The proposed framework would sweep in as potentially accountable a major retailer that creates a multi-tiered supply chain, comprised of a third-party logistics firm hired to manage the delivery and distribution of goods from the ports to retail stores, which in turn engages a logistics company to manage a warehouse where workers, supplied by a temporary agency or labor staffing firm, unload and pack shipping containers for distribution to the retail outlets, because that retailer is in a position to know of the work being performed and can control the operations of the businesses in the chain so that they comply with basic labor standards. This would be a particularly incisive attack on companies like Walmart, which has wielded subcontractors and contingent labor to degrade workers’ rights around the world—from its sweatshops in Bangladesh to its brutal warehouses in California and Illinois. If Walmart can so seamlessly link together its transnational production chain, it should be able to institute standardized protections for all the workers fueling its global hegemony. Companies manage what they measure; without accountability for outsourced labor, the workers at the margins of the market become invisible and expendable.